Virginia Union took down nationally ranked Virginia State, ending the Trojans’ 16-game win streak and giving them their first conference loss of the season. Entering Saturday, February 9, Virginia State had won 16 straight games, including a 15-point victory over Virginia Union in the Freedom Classic. Virginia Union’s Will Jenkins wasn’t going to let that result repeat itself. Jenkins recorded 23 points, on 11-of-16 shooting, and 14 rebounds, and the Panthers exacted revenge by defeating the 22nd-ranked Trojans 75-67 at Barco-Stevens Hall. The Trojans took control of the game early as William Vedder scored a quick four points and Jalen Jackson connected on a couple of 3-pointers. Struggling to find the basket through the first five minutes, the Panthers began driving and drawing fouls. Vedder, matched up with Jenkins, picked up two early fouls and sat the remainder of the first half. Behind Jenkins, who finished the half with 13 points and seven rebounds, the Panthers seized the lead via dominance on the boards. They earned 13 second-chance points and 26 points in the paint in the first half. A put-back slam by Jenkins set the tone and extended the Panthers’ lead to seven points. Demarius Pitts drilled a 3-pointer on the next possession to cap off the Panthers’ run and establish a 32-24 lead with five minutes remaining. Virginia Union carried its momentum into the second half. Terrell Leach scored 15 of his 21 points in the second half, and the Panthers shot 53 percent from the field. The Trojans were held to 42 percent from the field and just 5 of 21 from three in the half. As expected from a nationally ranked opponent, Virginia State made a run late in the second half. A Cyonte Melvin layup with five minutes remaining in regulation cut the Virginia Union lead to just three points. The Panthers responded on defense by shutting down the Trojans on five straight possessions. On the other end, Jenkins scored three straight baskets, including a tough and-one layup, to extend the Panthers’ lead to 13 points and put the game out of reach with 2:30 remaining. Virginia Union is now 15-9 overall and 10-3 in CIAA play. Virginia State drops to 20-4 overall and 12-1 in the CIAA. 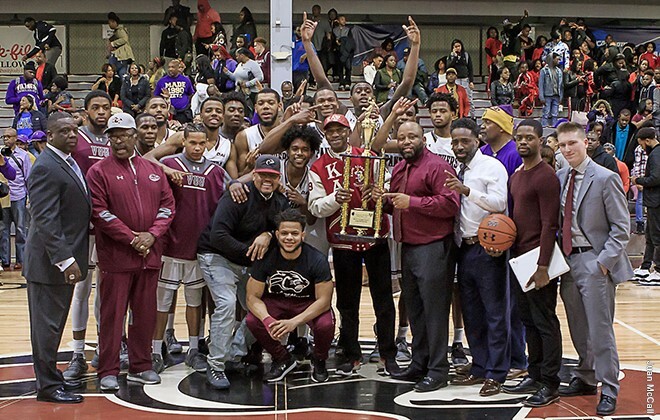 VUU now faces Bowie State University at 7:30 p.m. on Wednesday, February 13, at Barco-Stevens Hall in Richmond, Va.